The Religious Council is a tax-supported body to encourage harmony among the religions and pluralism in the society of the ASB. It has its origins in the Grand Council of State, which was one of the key bodies for diplomacy and government in the early years of the Confederation. The religious leaders were split into their own council, and deprived of most of their political power, in 1882. The Religious Council is therefore similar to the Chiefly Council in both its origins and its role in the ASB's institutions. The Grand Councils grew out of successive meetings between the French and allied Indian leaders, the Great Peace of Montreal in 1701 being the archetype. As the councils grew and became more regular, missionaries and later bishops were integral members. In the late 1700s and early 1800s, the Grand Council emerged as a permanebt body for continental diplomacy. Religious leaders who attended now included the bishop of San Agustín, Moravian missionaries, Anglican prelates from the Loyalist states, and the head of the Lutheran church in Christiana. By 1820 the Grand Council was one of the key institutions of the confederation. While the Congress represented the state governments, and the Parliament would eventually represent the people, the Grand Council represented the permanence of the alliance itself. It was assuming a role as the guardian of the confederal constitution. While Congress was kept busy with the day-to-day work of managing confederal affairs, the Grand Council dealt with the major questions of how to interpret treaties, resolve borders, and share power. In 1865 it took on the responsibility for foreign affairs when it negotiated a treaty with England. This was a lot of power to be taking on, so there were calls to regularize the Council's membership. A motley gathering of leaders was fine when the members were tribal societies and paternalistic colonies, but now they were states. They needed clearer rules about who was to govern. In 1836, at the urging of republican states, the Council removed all members who participated as holders of hereditary titles, forming them into the powerless Chiefly Council. An increasing work load meant that other ex officio members were also gradually dropped. Heads of state governments, for example, ceased to be Council members in the 1840s, since they no longer had the time. To replace them, the Council delegated to Congress the power to choose statesmen from the various states to sit on the Council full time. But for a long time, the clergy stayed around. Although the republics had largely disestablished their state churches, they did not find the clergy to be as inherently offensive as the hereditary chiefs. Even the reforms of the 1870s, in which Parliament took from Congress the power to name Council members, did not touch them. The real problem came to be not the separation of church and state per se, but the growing size and diversity of the population. Bishops and church leaders multiplied in the country, but the Grand Council was reluctant to just admit multitudes of clergy to its ranks. It was starting to look very anachronistic to seat only a few religious leaders who just happened to hold seats that were historically important. On the other hand, it was considered worthwhile to have a national forum to foster religious pluralism and dialogue. Therefore, a new religious council was created in 1882 for this purpose, and the remaining religious left the Grand Council. Subsequent reforms removed the last remaining ex officio members, leaving only the Parliament-appointed members. The new council was modeled on the Chiefly Council: a body that was not part of government but was nonetheless near it, at the heart of the ASB. Unlike the CC, it does receive modest tax support to fund its activities, things like travel and publishing. Its role is often described as "established pluralism": harmony among the different religions is as much part of the ASB's mission as is harmony among the states. Its members include leaders from across the ASB's religious spectrum, including the non-Christian religions that have grown with modern immigration. Revivalist indigenous and African diasporic faiths have won a place as well. Since its creation, the mission of the Religious Council has been threefold: (1) to promote interfaith relations, (2) to reach and express consensus on major issues facing the Confederation, and (3) to act as a check on confederal laws affecting religious practice. Its members have no party affiliation. They elect their officers at each annual session; these include a President, a Deputy President, and three other members of a committee of officers that continues to exist when the Council is not in session. The first function is by far the most prominent and takes up the bulk of the Council's time and effort. The Council normally holds only one meeting per year usually lasting one to two weeks. It also meets in special sessions during ceremonial events such as the opening of Parliament. Most of these sessions have the character of an interfaith conference. Leaders meet and socialize. They discuss issues in formal and informal settings. They continue dialogues that their respective churches had begun at the local level. They arrange interfaith efforts and events that will take place throughout the year. Secondly, the Council may pass Advisory Resolutions that speak to important questions facing the ASB government or the governments of individual states. The Council's enabling acts require a two-thirds majority to pass such a resolution, meaning that such official advice must reflect a broad consensus of the ASB's religious leaders. The Religious Council was especially active in passing Advisory Resolutions during the period from the 1930s to the 70s, when many states were confronting their systems of racial segregation and legal inequality. The Council's votes during this time were an important part of the political discussion on race. They emboldened clergy to speak out more strongly for equality within their own states and provided cover to politicians wavering on the issue. Thirdly, the Council has retained actual power in one area: it may vote to overturn legislation that pertains to religious institutions or religious practice. The procedure for doing this is rather complex. At each annual session, the Council approves twelve delegates to the government, each of whom will serve for one month of the coming year. During a delegate's tenure, he resides in the capital where he and his staff review acts of Parliament and act as a liaison between the Religious Council and the government. When the delegate finds that an act will affect religious practice in the ASB, he asks that the Grand Council of State empower the Religious Council to consider it. The five officers of the Religious Council then meet as a committee and decide whether to take up the issue. If they decide not to take it up, then the act becomes law without any further action by the religious leaders. If they do take it up, then the act is delayed until the next session of the Religious Council, either a regular annual session or a special session that the committee may call. When the Religious Council does meet again, they may vote to overturn the act of Parliament with, again, a two-thirds majority. This power is seldom invoked, but is considered a part of the Council's legacy as one of the confederal institutions. One well-known example of the Religious Council using its power came in 1914, when a reformist Parliament passed a bill requiring all states to provide a system of nonsectarian public schools. Catholic members of the Council persuaded the rest that the bill placed undue burdens on religious schools, and the bill was overturned. The following year, Parliament passed a modified version of the bill that met the clerics' objections; while some Catholic leaders still opposed it, they were not able to obtain the votes necessary to stop it. Most of the religious bodies represented in the Council send one member. Some larger groups send more than one. Roman Catholics, by far the largest group in the Confederation, send the most. A few archbishops are automatically members ex officio - the sees that historically sent members to the old Grand Council such as Montréal and San Agustín. Along with them come the senior-most archbishops from each of a half-dozen regions. There are a few other groups that send multiple members, such as the Methodists and the Evangelical Lutherans. The Latter-Day Saints, divided as they are into multiple denominations, do not have any one body big enough to send multiple members. The Moravians are not huge, but have multiple ex officio members due to their historic importance. There are some wrinkles in this scheme. Difficult questions include: How to give a voice to unorganized expressions of Boreoamerican religion? These include both indigenous faiths and African diaspora faiths like Vodou and Santería. How to distinguish these authentic expressions from kooky new cults and nonserious religions - your Jedi, your Satanists, your Universal Life Churches - which always clamoring for inclusion? One thing that the members don't want is to be constantly bogged down in debates over who gets a seat at the table. That's not why they're there and it's not what they signed up for. The most sensible thing is to have a committee on membership and have everyone else agree to keep membership debates to a minimum outside that committee. This also leads to much broader questions about those unorganized and less-organized religions. The Indians in Boreoamerica converted to Christianity in large numbers to the point where conversion was considered the norm. But unlike in Spanish America, this conversion was never forced, and Indians who were skeptical of Christianity or loyal to the old traditions did not face the same pressure to disguise their practices. So conversion was widespread, and certainly there has been that thing where indigenous customs persist in a Christian guise, but it was not 100%. Native religion survived in pockets throughout the Indian states. The more recent change, since 1900 or so, has been efforts to organize these disparate groups to give them more visibility and coherence. The African diaspora religions are a still different story, because, originating in a context of slavery, they were actively suppressed throughout history. Many people, including many practitioners, consider them to be nothing more than witchcraft or deviant Christianity. Just as in our timeline, it is only recently that there has been an awareness of them as distinct religious traditions. Compared to our timeline. I imagine that they are more widespread in continental North America, including in some parts of the Anglophone states like the Bahamas and southeastern Carolina. Anticlericalism has been a force at various times and places in the ASB, so there have been calls to defund or abolish the Religious Council, a tax supported religious body. It hasn't happened yet, but funding has dropped quite low under some administrations. In addition, the existence of the council has encouraged the formation of organized humanist or freethinker societies, which have representation. In this I'm trying to channel the later 19th century of our timeline, where the Freethinker movement was going strong. It came with immigrants from the European continent, Germans, Czechs and so forth. Then it sort of fizzled, with some of the surviving congregations getting absorbed into the Unitarian Universalists. In the ASB, the movement kept its vitality, if nothing else because of this pressure from the top: prominent secularists strove to maintain their organization to remain part of the national conversation on religion. In our world, the main group that does this is the UUs. In the ASB, the Unitarians and Universalists kept their identities as radical or liberal churches within the Christian tradition, rather than shift toward a purely secularist outlook. That niche was filled by established Freethinker groups, and maybe some newer groups similar to the Ethical/Ethical Humanist movement. Quakers also are quite prominent, due to their historic role in Pennsylvania and its neighbors, and they also tend to be rather secular, with some identifying themselves as Christians and others not. Briefly, in a culture where a lively religious pluralism is closely connected with civic life, the nonreligious have more of a tendency to participate in liberal and secularist quasi-religious organizations compared to our own world, where the norm is simply non-participation. Not that all or even most non-religious participate in groups like this, but just that it is more common. Near the center of bigger towns it's just more normal to have the Catholic church, one or two Protestant churches, the Quaker meetinghouse, and some kind of Freethinker house. I'll add that this is much more the case in states with a strong tradition of religious pluralism, which is to say the states with an English or mixed heritage rather than French or Spanish. In the states where the Catholic Church has been dominant, the nonreligious are more likely to be either "cultural Catholics" or anticlericalists, the latter of which hate the whole idea of churches and don't feel inclined to imitate them. The seal or logo of the Religious Council is at the top of this page. Its overall form suggests the Four Directions symbol, also called a sun cross, which is important in the iconography of many Indian nations. The center part is suggestive enough of a cross to make Christian leaders happy, and its pointed form suggests radiating knowledge. 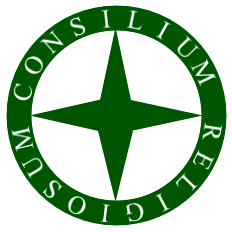 The seal includes the name of the Council in Latin and is most often rendered in confederal green.